A microfluidic biosensor that can count red blood cells, platelets, and white blood cells electrically using just one drop of blood (11 microL) has been developed by University of Illinois at Urbana-Champaign (UIUC) researchers, replacing the standard hematology analyzer, a large, expensive lab device that requires trained technicians and physical sample transportation. The new biosensor can electrically count the different types of blood cells based on their size and membrane properties. To count leukocyte and its differentials, red blood cells are selectively lysed and the remaining white blood cells were individually counted. Specific cells like neutrophils are counted using multi-frequency analysis, which probe the membrane properties of the cells. The device, which will use credit-card-size disposable cartridges, requires minimal or no experience. It is expected to find uses in hospitals at the bedside, private clinics, retail clinics, and the developing world. Patients can perform the test at home in under 20 minutes and share the results with their primary care physicians electronically, reducing the cost of the test to less than $10, compared to $100 or more currently, says UIUc Professor Rashid Bashir, principal investigator. Complete blood cell counts (CBCs) are one of the most commonly ordered and informative blood tests in hospitals. The results from a CBC, which typically include white blood cell (WBC) counts with differentials, red blood cell (RBC) counts, platelet counts and hemoglobin measurements, can have implications for the diagnosis and screening of hundreds of diseases and treatments. Bulky and expensive hematology analyzers are currently used as a gold standard for acquiring CBCs. For nearly all CBCs performed today, the patient must travel to either a hospital with a large laboratory or to a centralized lab testing facility. There is a tremendous need for an automated, portable point-of-care blood cell counter that could yield results in a matter of minutes from a drop of blood without any trained professionals to operate the instrument. We have developed microfluidic biochips capable of a partial CBC using only a drop of whole blood. 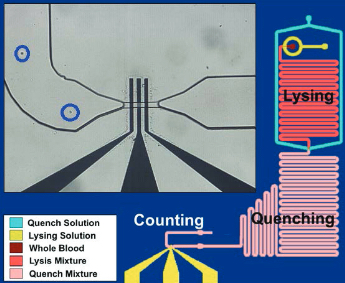 Total leukocyte and their 3-part differential count are obtained from 10 μL of blood after on-chip lysing of the RBCs and counting of the leukocytes electrically using microfabricated platinum electrodes. For RBCs and platelets, 1 μL of whole blood is diluted with PBS on-chip and the cells are counted electrically. The total time for measurement is under 20 minutes. We demonstrate a high correlation of blood cell counts compared to results acquired with a commercial hematology analyzer. This technology could potentially have tremendous applications in hospitals at the bedside, private clinics, retail clinics and the developing world.